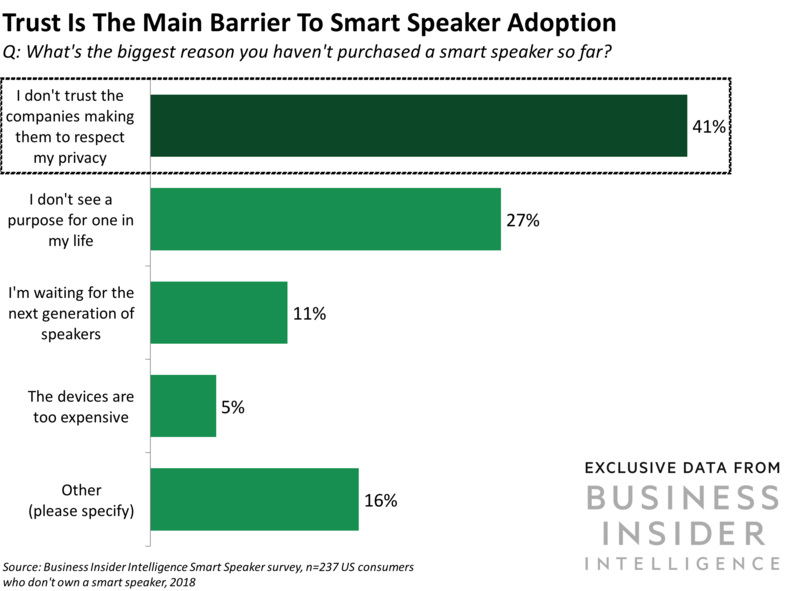 To offer these stakeholders insight, Business Insider Intelligence asked more than 500 US consumers about their knowledge of smart speakers, the devices they do or don’t own and what led them to their purchase decisions, as well as the tasks they’re using their smart speakers for. In this report, Business Insider Intelligence will look at the state of the smart speaker market and outline how each of the major device providers approaches the space. We will then focus on the key factors that affect whether or not someone owns one of these devices. Next, we will use our survey data to outline the reasons why people don’t own devices in order to offer guidance for who to target and how. Finally, we will discuss what consumers are actually doing with their smart speakers — specifically looking at how the devices are used and perceived in e-commerce, digital media, and banking — which can help companies determine how well they’re publicizing their smart speaker services and capabilities.